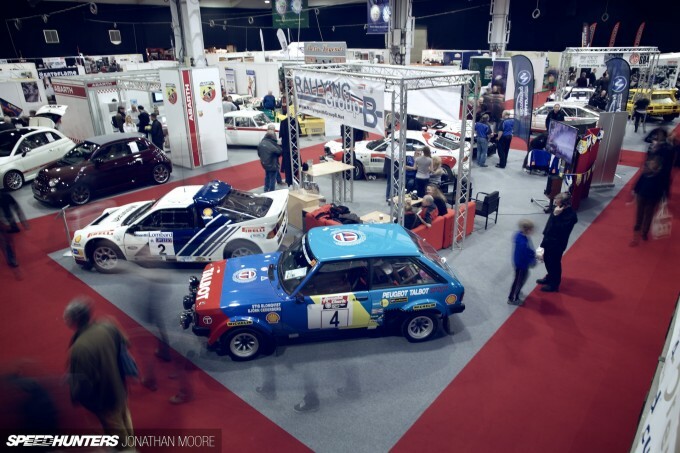 On the outside, Race Retro appears like a nice, relaxed place. Where you could – and can, in fact – buy a tweed jacket and silk tie. And have a nice cup of tea. Where cars would be driven genteelly, not making too much noise. 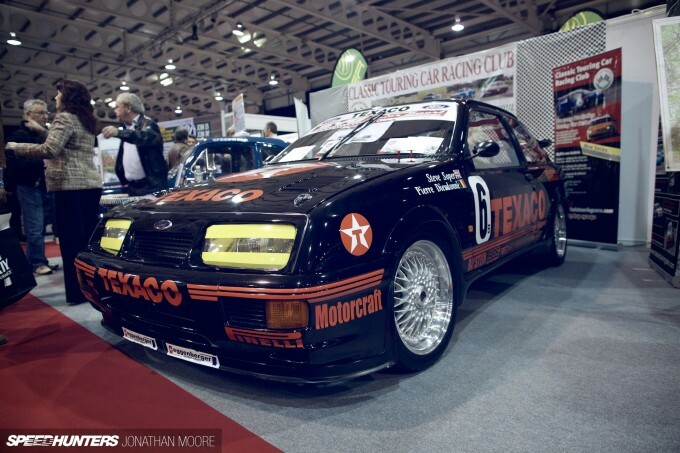 In fact, Race Retro is exactly the reverse. 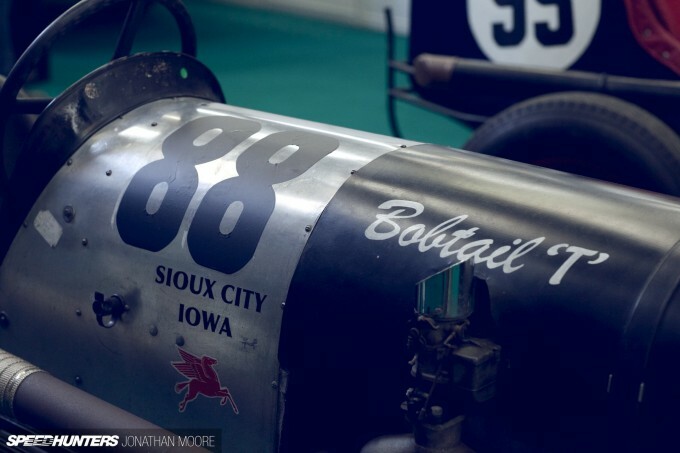 It’s where old racing monsters are kept, growling in their cages, straining to be unleashed on the competition season ahead by drivers too young to know better or too old to care. Every car was subject to a tidal surge of people ebbing and flowing around it – particularly if the pedigree is impressive. Every so often the shrill note of an engine broke the respectful silence, but mostly I think it was the sound of me gently sobbing as I took in the cars around the show. I wasn’t the only one. 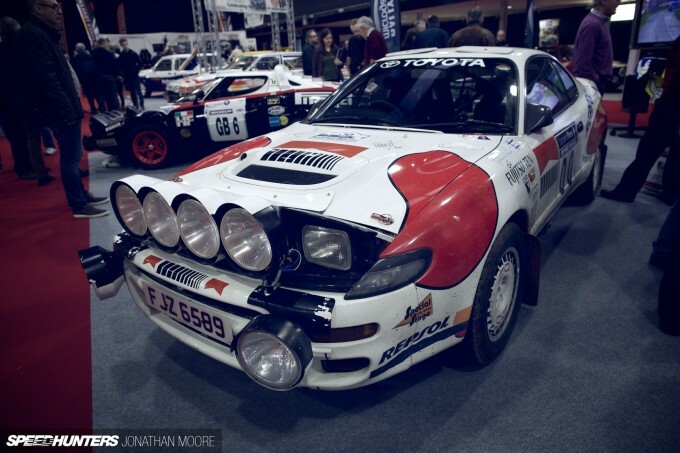 This year’s Race Retro showed off the usual eclectic mix of circuit racers and rally weapons from across the decades, with a good 50-year spread of post-war machinery and on into the ’80s that included, of course, a more than healthy smattering of Group B and WRC cars. 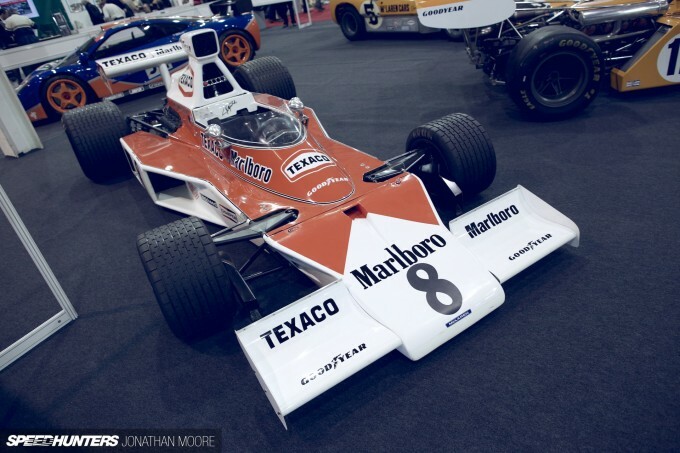 Several notable anniversaries were marked as well, including McLaren and the 40th anniversary of their first Formula 1 title, and the 30th birthday of a T-Rex in sheep’s clothing, the Group B Metro 6R4. 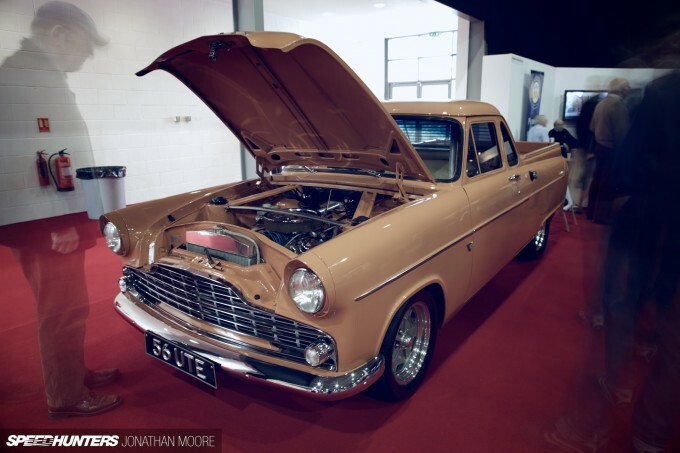 Old cars are big business nowadays, in the most positive sense of the phrase. 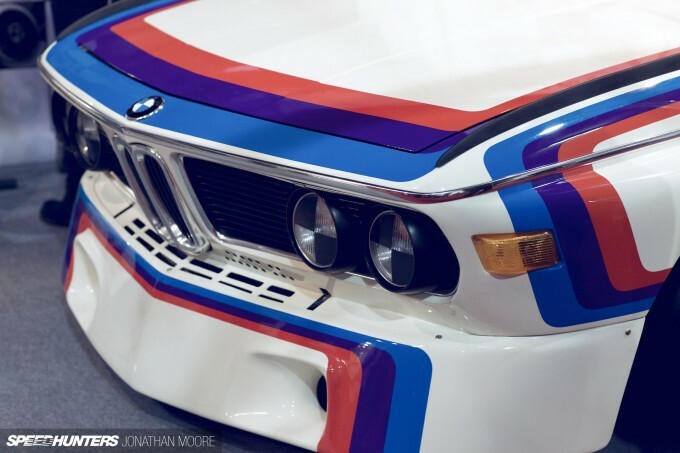 You can’t take it for granted that every car is original – though some, like this 3.0 CSL had a BMW certificate of authenticity to prove itself with – but even those that aren’t are more than worthy. 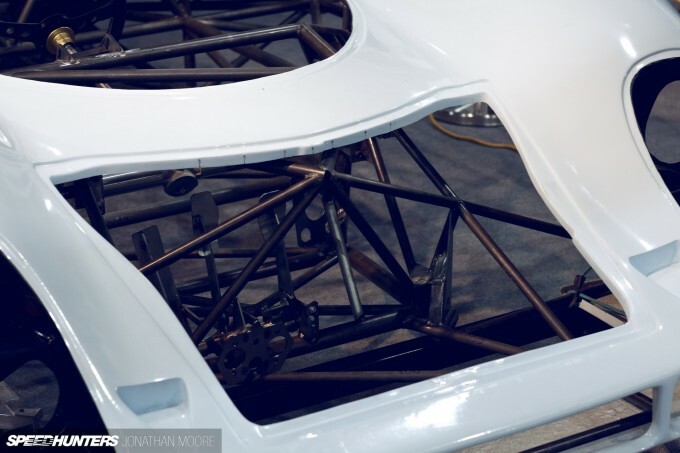 Sometimes the original car is more than well-known – though this 917 is more than a mere kit replica. 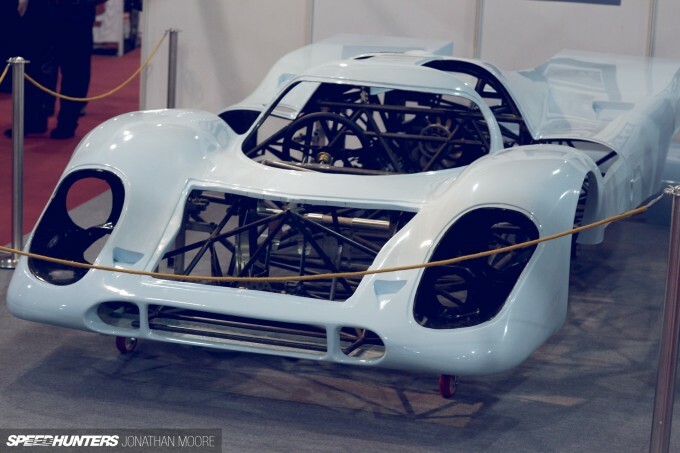 Dave Eaton, who runs Icon Engineering, bought an original 917RSK shell. And then decided to retrospectively design all the other components in CAD so he could bring his Porsche back to life. And then make more. This is something I love about shows like this: being able to see under the skin of a car. 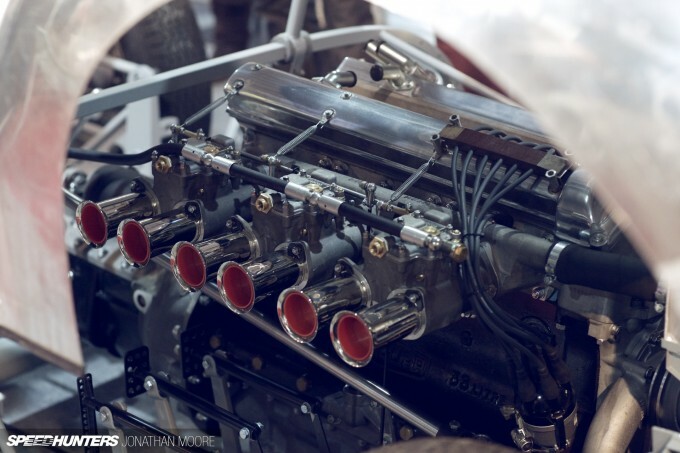 Not just an open bonnet, but a 917 effectively mid open heart surgery, with its beautiful tube frame skeleton on display. It was truly a unique opportunity. It shows that old doesn’t mean low tech. 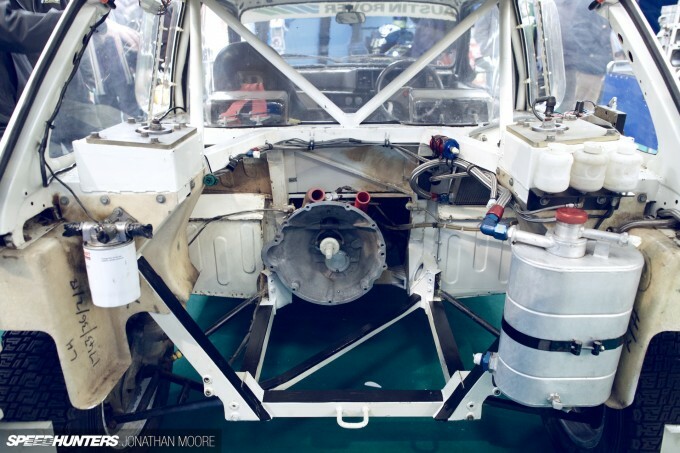 With historic racing enjoying such popularity, and iconic cars now becoming sometimes too valuable to race, technology plays a big part not just in maintenance and preparation, but also recording precise build data so that new panels can be created. 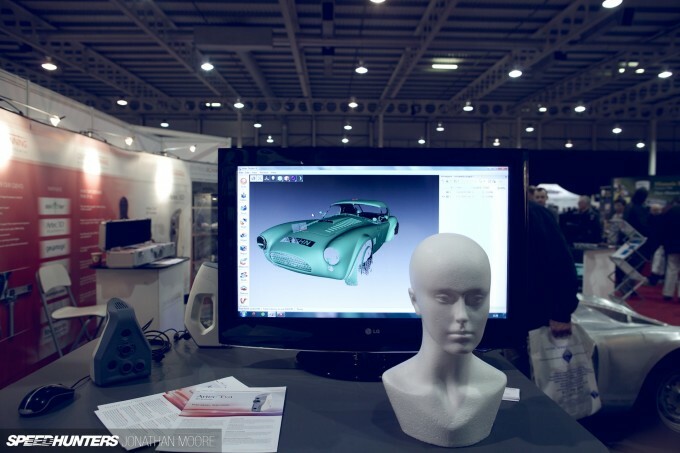 Central Scanning use 3D digital scanners to measure bodywork with pinpoint accuracy; new bucks can then be made. The same process can be used for mechanicals as well. 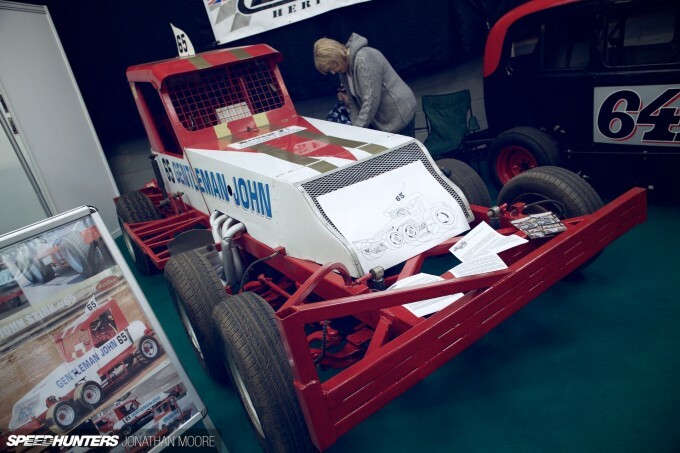 Frequently the throng at Race Retro meant it was almost impossible to get a clear view of something, which usually meant that something particularly interesting lay behind. 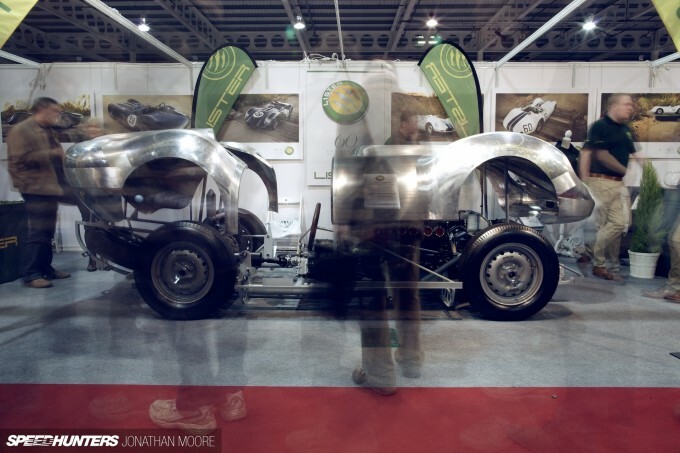 This is a fearsome Lister ‘Knobbly’: the reactivated Lister Cars are working on a continuation run of these beasts. 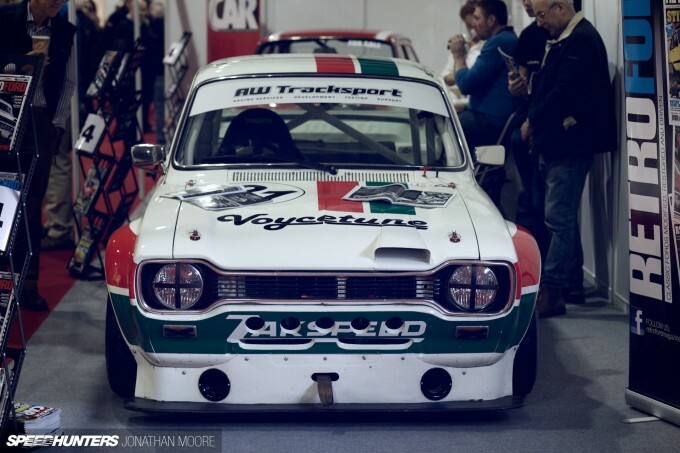 These are all examples of passionate rebuilds to original spec, to be found all about Race Retro, that could stand side by side with originals. 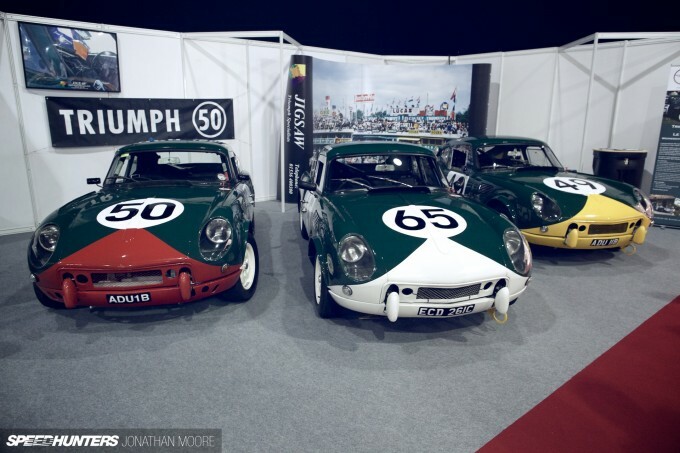 Here you have one original Triumph Spitfire that raced at Le Mans 50 years ago, alongside replicas of its sister cars from that year. 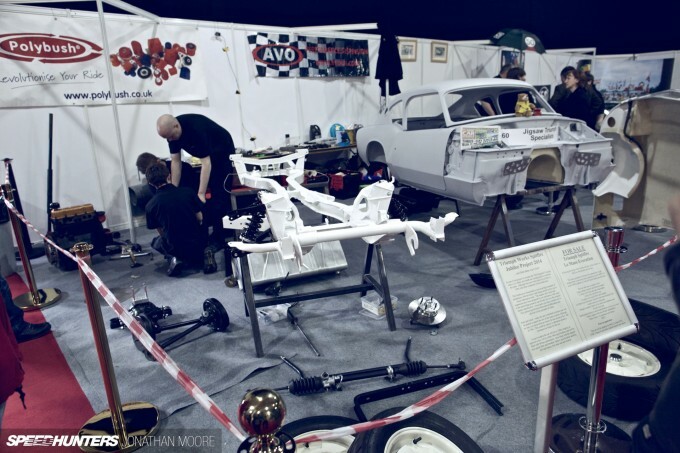 A fourth car was in progress – being built live at the show! 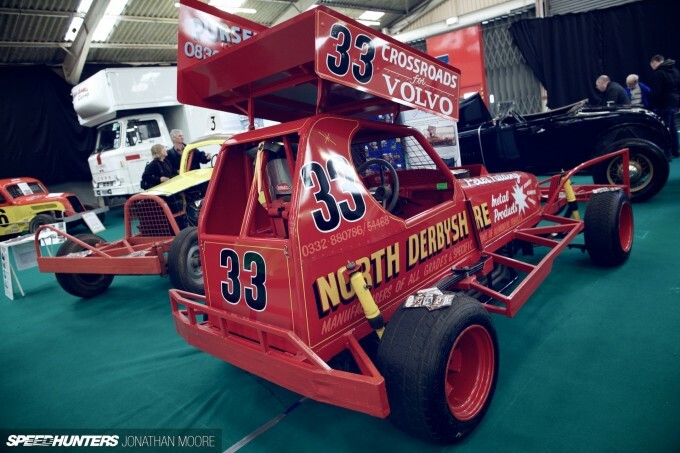 The aim was to complete the car over the three days of Race Retro. Another thing it was impossible to miss was the collection of fast Fords. 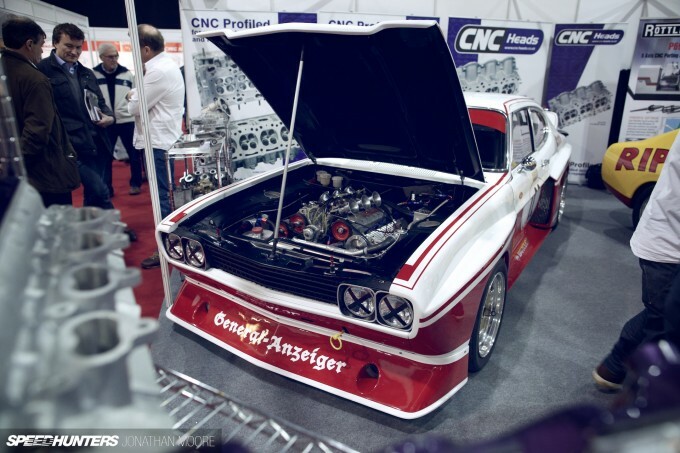 This Mk1 Zakspeed homage would have made our inveterate Ford man Paddy happy, I reckon. 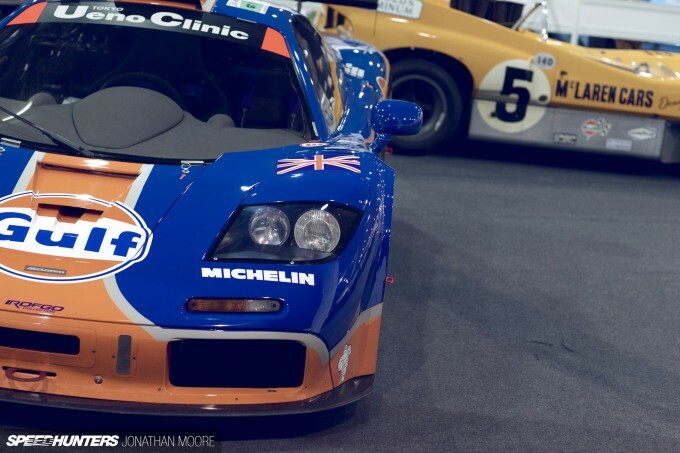 It certainly looked as good as the original car I spotted at Kremer during a tour there a while back. 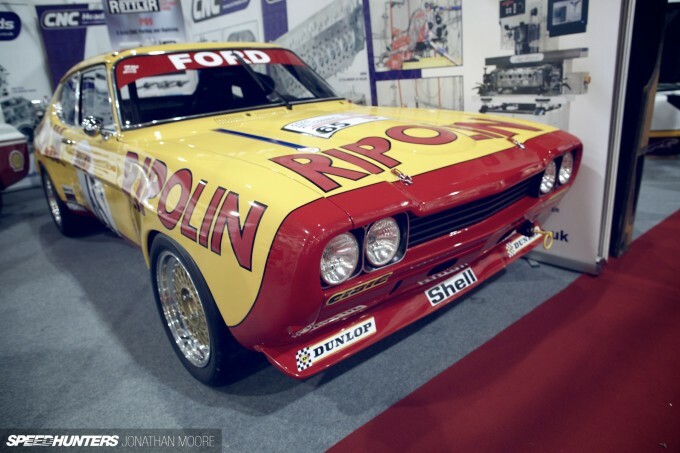 A pair of Capris stood on CNC Heads’ stand: firstly this RS2600 made out in a 1972 European GT livery. The second was a wide-body RS3100 in DRM spec – on the outside at least. Road cars were few and far between for obvious reasons (Silverstone Auctions’ halls aside), though calling this Zephyr a road car might be a little tenuous. 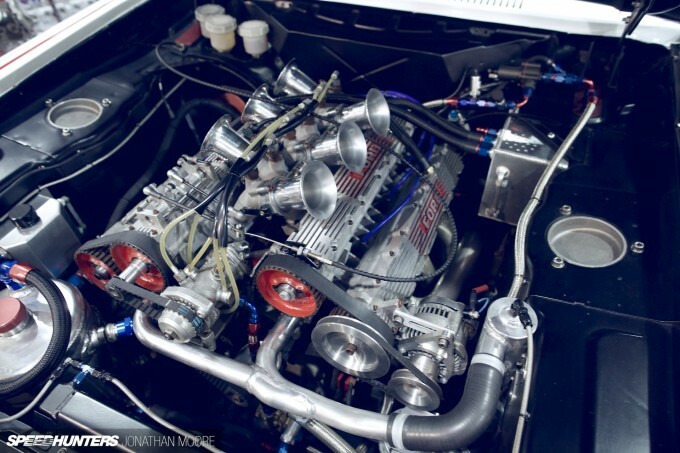 This was a 1956 Coupe Utility with a difference: the difference being the small block 5.7-litre V8 making 461hp naturally and another 200hp when hopped up on nitrous. 60mph? 2.6 seconds. 100mph? 5.2 seconds! This brute Ute does this in fact. As the sign said, ‘Every feature increases Coupe Utility Efficiency’! To end my little section of Ford love, there’s no better place than with a legendary Eggenberger RS500; I hope to catch some of these in the HSCC Super Touring Car races during the year. It wasn’t all about the familiar though, by any means: this Bobtail T headed up an eclectic collection of Americana. Next door was an area I should have paid more attention to last year, but will definitely follow up on during 2014. I enjoyed Larry’s visits to the fast and furious World Of Outlaws last year, and really need to explore the European scene. And it’s not just four wheels that deserve attention. 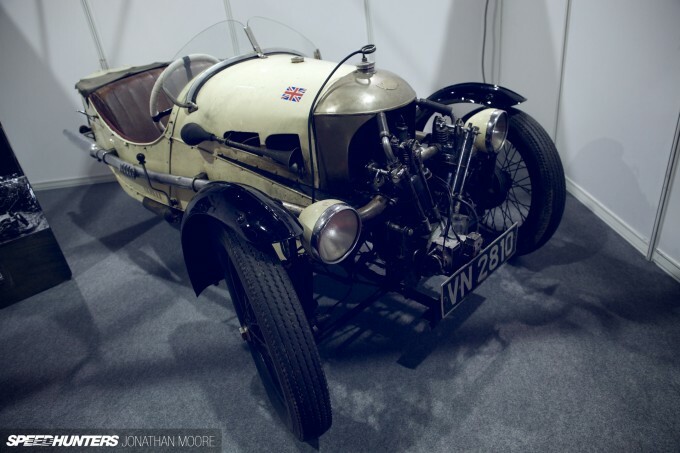 This Morgan Three-Wheeler bucked the trend of new cars looking like old ones: it’s an original 1930s model that raced at Donington (in the same era as the Auto Unions, if not actually with them…). Then, if three wheels is still too many, how about two? 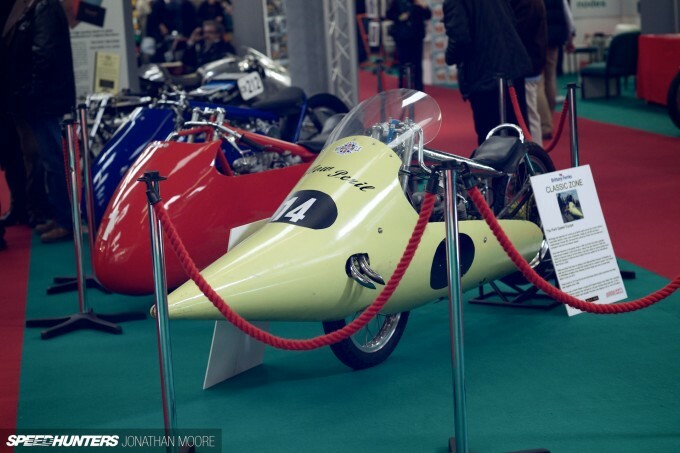 We don’t often feature bikes, which is a bit of a shame, but some of the machinery at Race Retro deserves mention. Especially when, like this one, they’re called the Peril Speed Equipe. 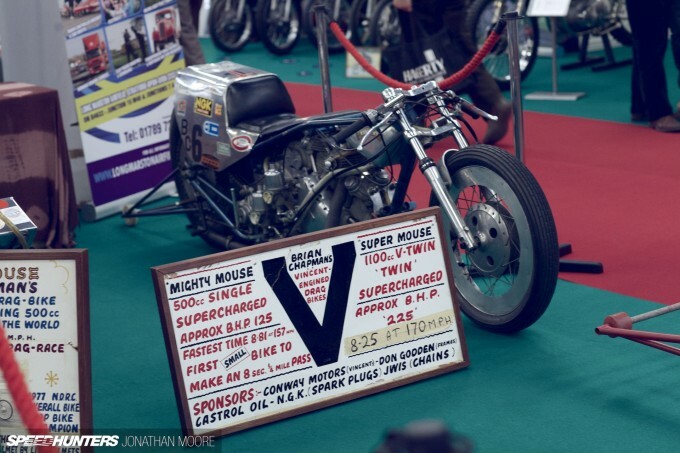 This crazy drag bike was campaigned in the 1950s, and could manage a 13.39 second quarter mile. Notice the front-exit exhausts, which was due to space constraints inside the fairing. 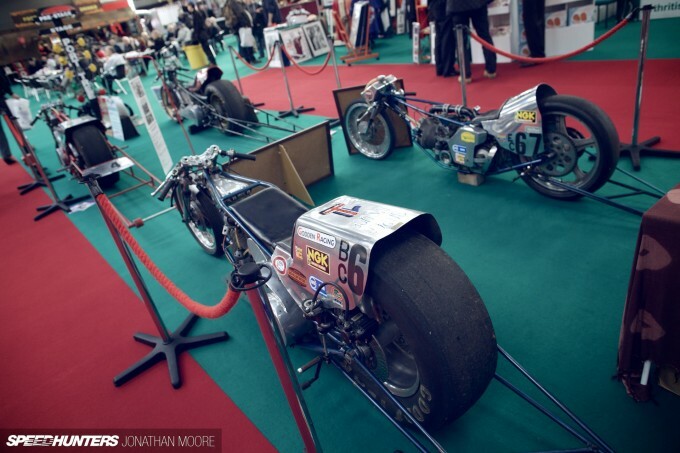 There’s something even more completely and utterly insane about drag bikes than even ‘regular’ drag cars. I mean, look at the figures here! This is where you… sit? Lie? Weep? I salute all the maniacs who participate on two wheels. 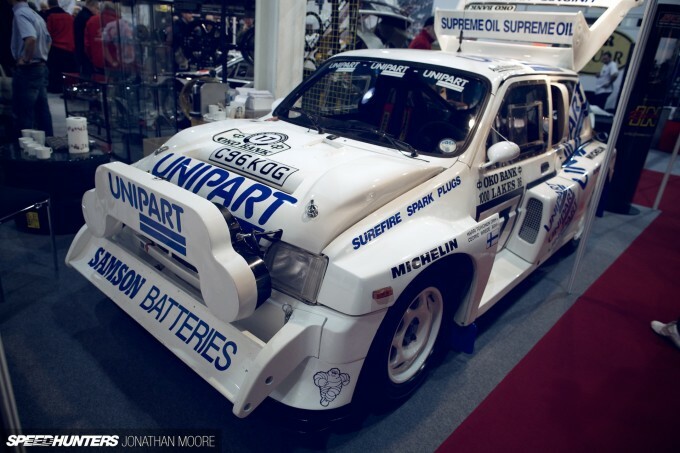 It’s probably the only thing that makes Group B rally cars look sensible. 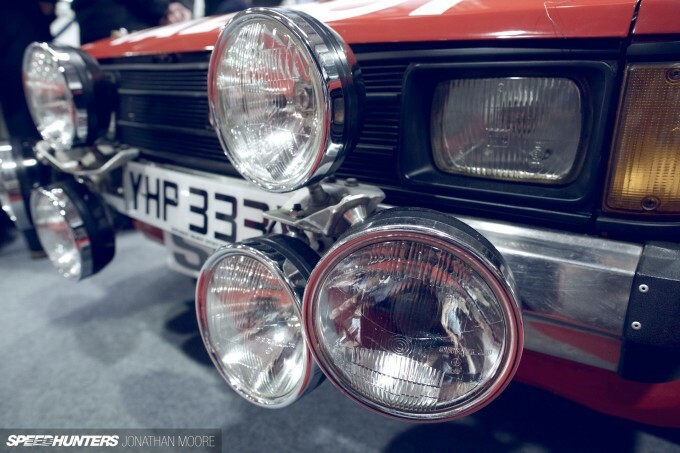 Chapter 3 – Did someone mention Group B? 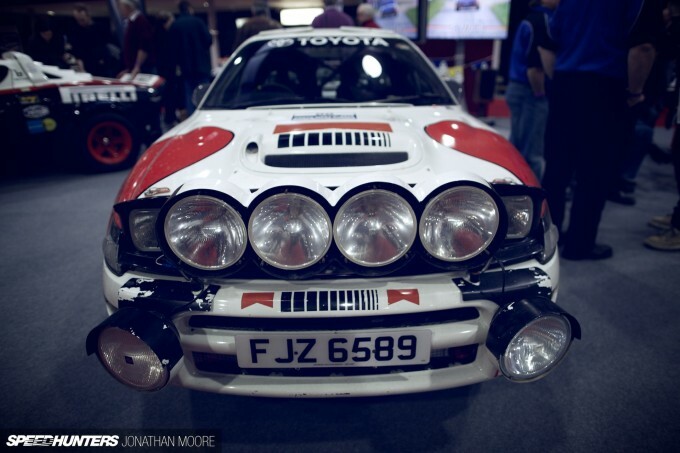 Which neatly brings me onto one of the highlights of Race Retro: the fact you can virtually drown in awesome rally machinery. 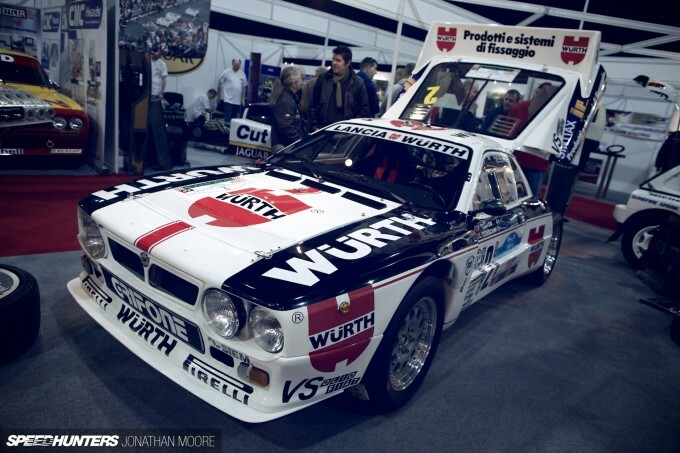 The halls are awash with iconic cars, like this Lancia 037. Outside, many of their sisters would be unleashed in an effort to remodel Stoneleigh Park’s perimeter roads into mud baths. It would be joyous, as I will describe later. 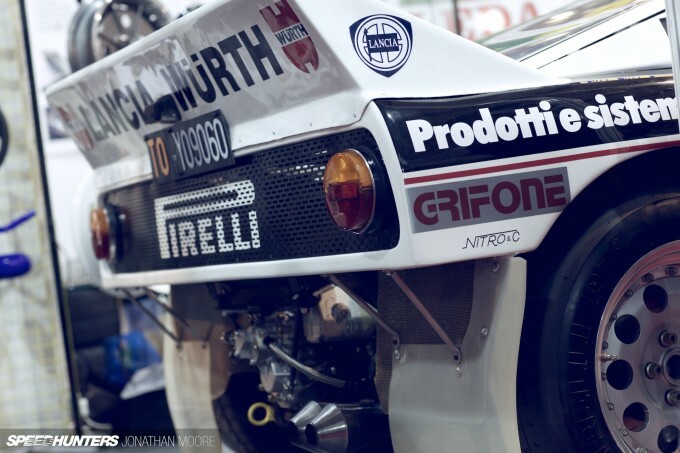 But even static Group B cars set the heart racing. 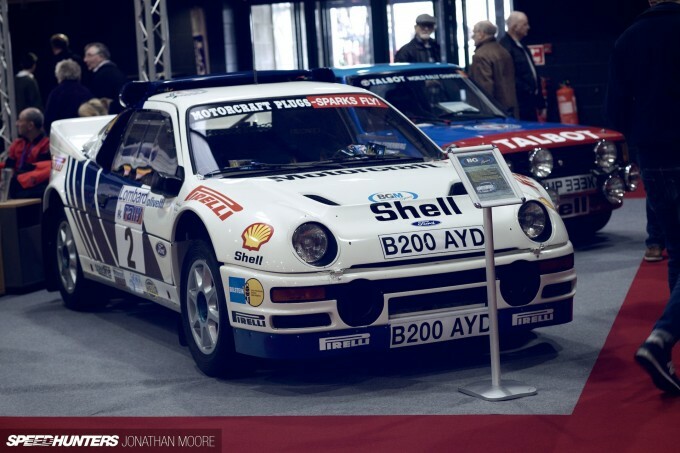 Unfortunately there wasn’t an RS200 on the tight and twisty rally stage, but there was this pristine factory car on the Rallying With Group B stand. 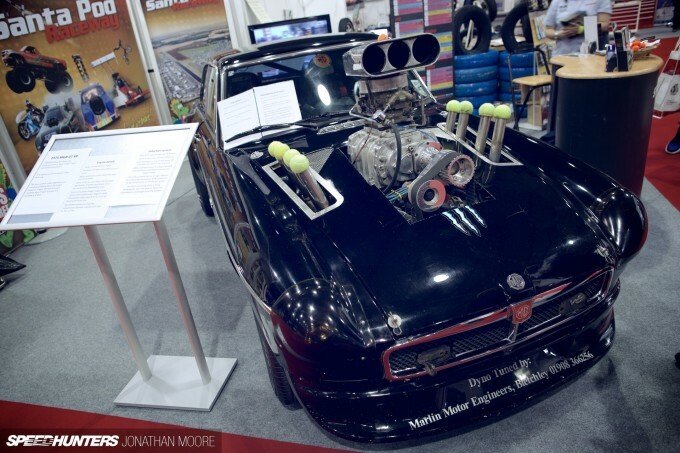 These guys always turn up with a whole phalanx of incredible cars, and 2014 was no different. Some scenes are about being low, or high-powered. This stand showed that it’s all about what you’ve got hanging out front. The bigger the lighting pack, the better. 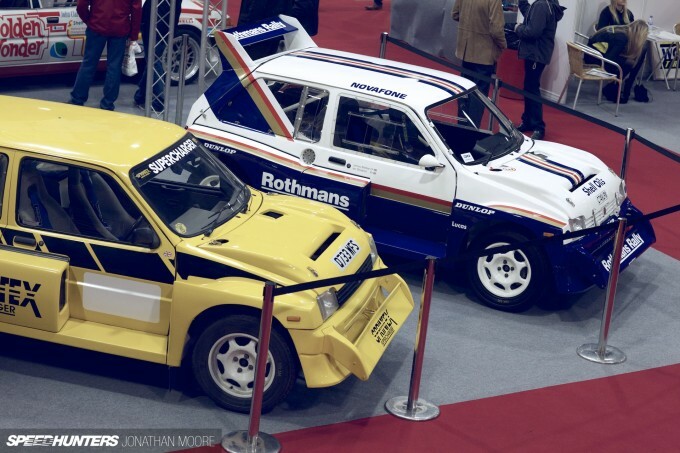 Taking pride of place was this pair of Metro 6R4s, a car that was surely the result of a very long evening of intoxicants. I mean, a Quattro you could understand. A Lancia as well. 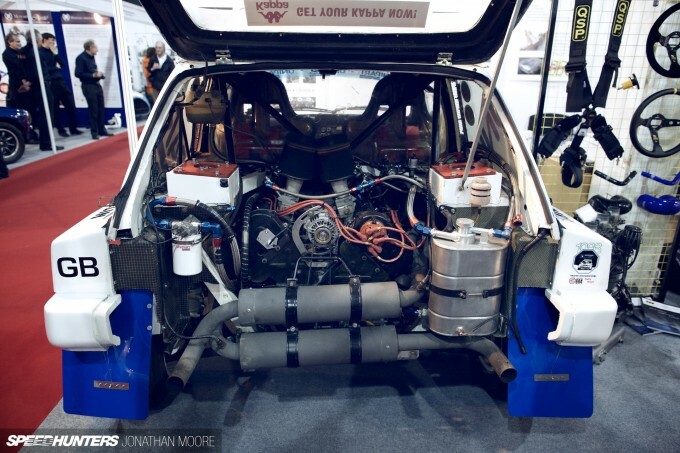 But the Metro sits alongside other hot hatch works of madness like the Renault 5 Turbo and Peugeot 205 T16. Teensy underpowered shopping cars bitten by radioactive predator monsters. 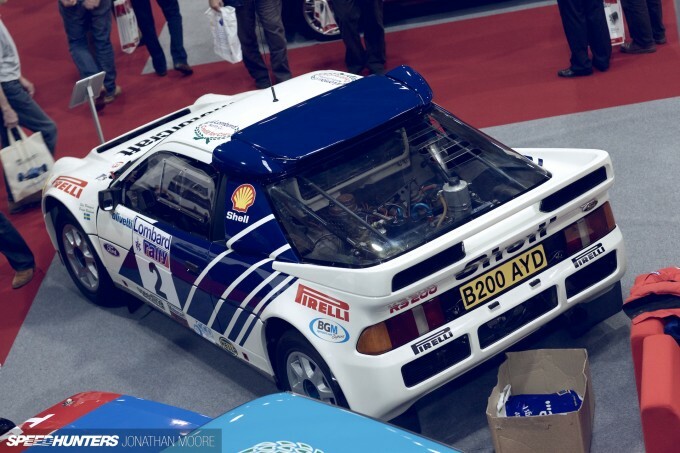 There would be a good number of 6R4s playing in the mud, giving people the visual demonstration of how fast these cars were, coming as they did at the tail end of the Group B era, when they really were becoming ‘too fast to race’. Look under the tail-gate, and there’s a riot of a V6 crammed in, ancillaries and cooling squeezed in wherever space could be found. 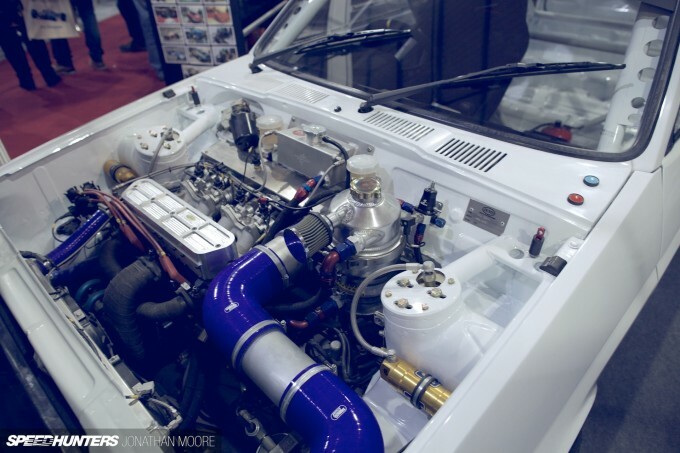 Another 6R4 further into the show, a restoration in progress of a homologation road car, gives you an idea of the space there was to play with – or the lack thereof. 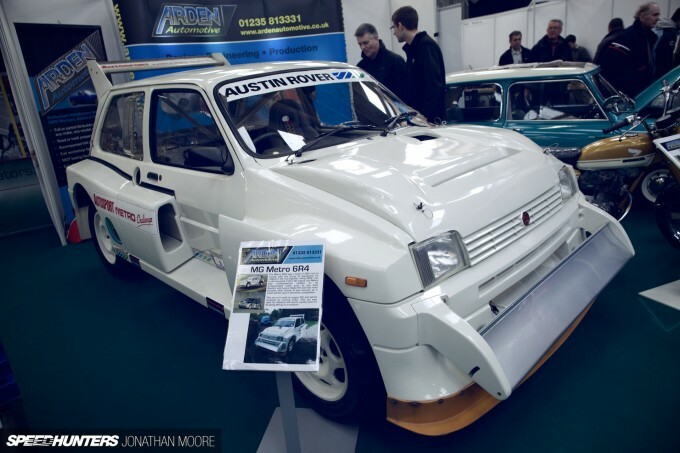 This 6R4 is being restored by John Pick at Arden Automotive, adding another level to his Mini collection – he also restored the beautiful original Mini Cooper S we featured last year. I imagine they’ll be a little bit different to drive. 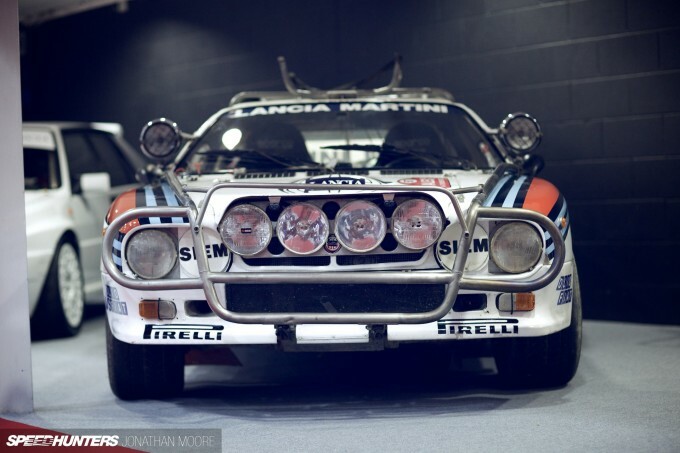 Back to Lancia, who had a dedicated display line adjacent to the Rallying With Group B team. 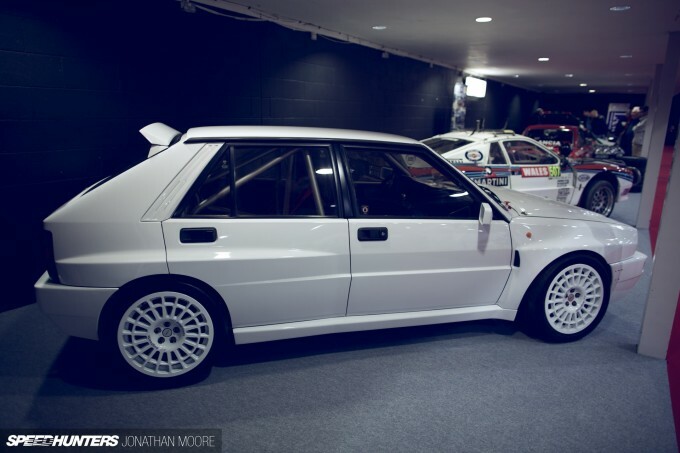 The Delta Integrale might make an insane platform when mated with a Supra, but the original isn’t half bad either, is it? 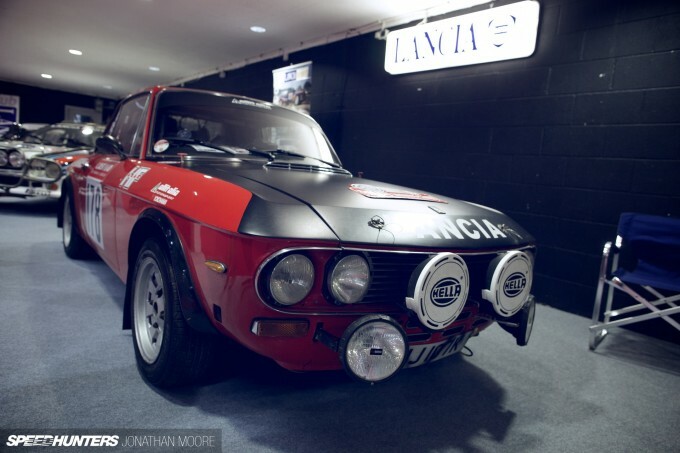 But then Lancia have a history of making beautiful cars, at least until the last decade. 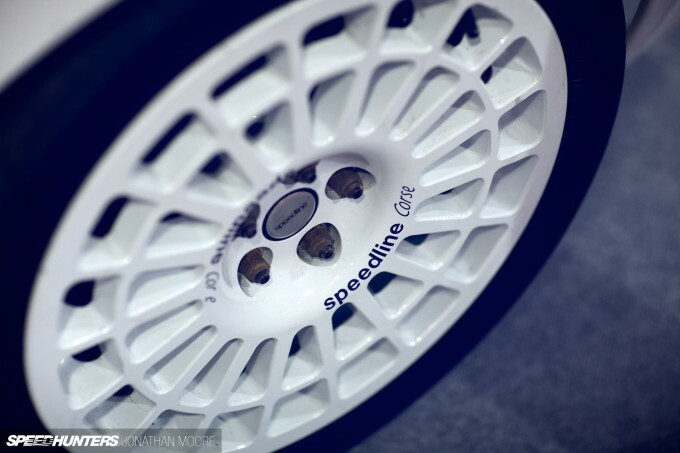 For all the displays and how easy it was to treat Race Retro like an exhibition, the key point to remember is that it’s about competing. Getting involved. 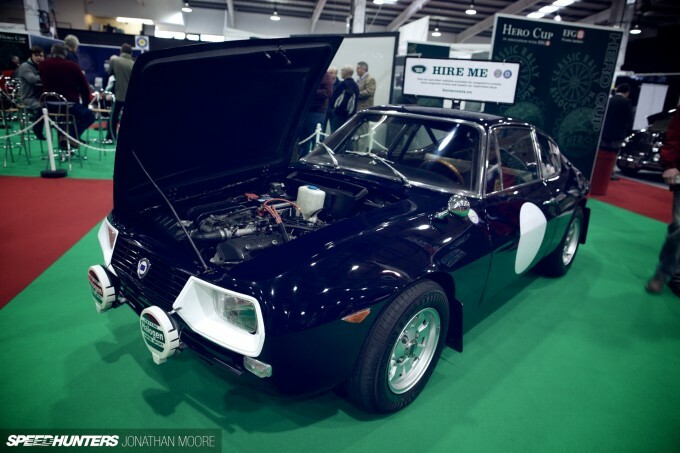 As this Lancia Fulvia offered, most cars were there to be competed in, not for show. 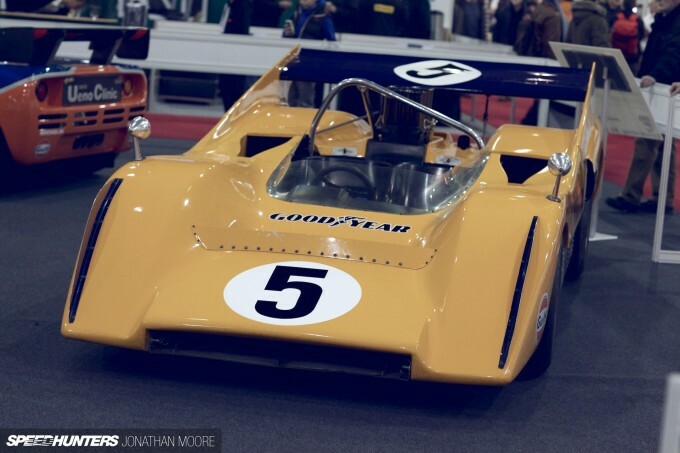 That said, one area which was purely about aesthetic pleasure was the McLaren corral, with epic racers supplied by McLaren and from Roald Goethe’s breathtaking RofGo collection. 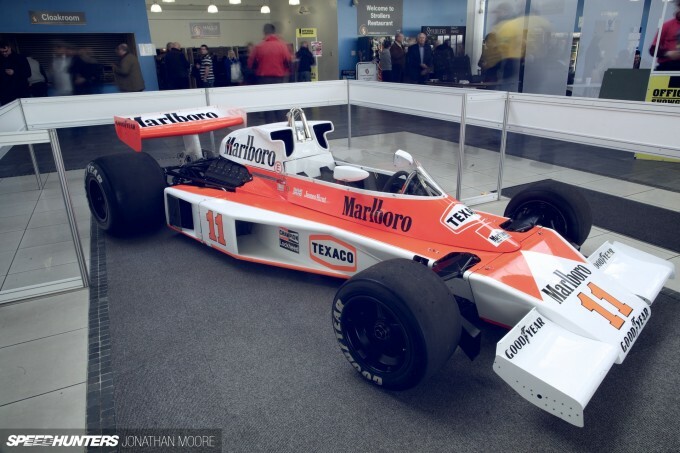 The appetiser was James Hunt’s title-winning M23 from 1976 sitting in the foyer. 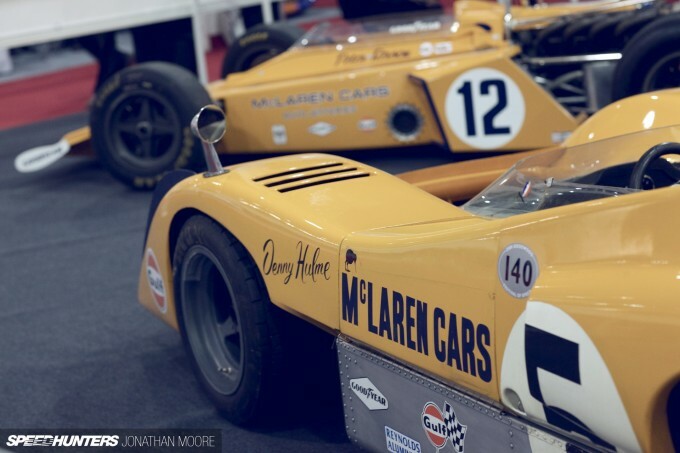 Just inside the main hall, a further quartet of McLaren’s single-seater and sports car output. The final area to take in was the auto jumble and memorabilia hall. 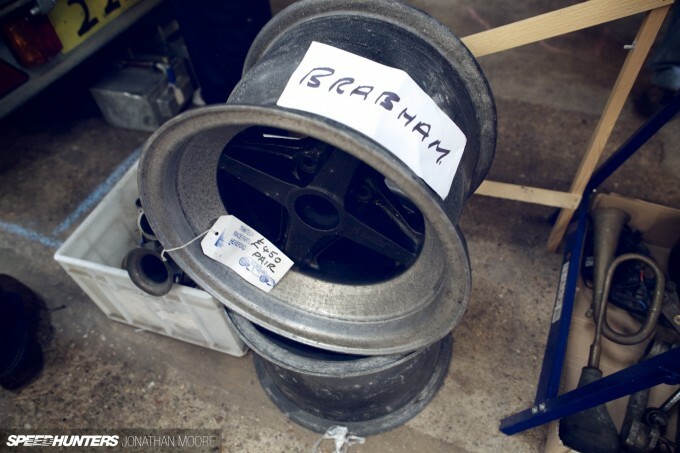 This was a true Aladdin’s Cave of automotive cast-offs, though you needed a good search to hit gold – like these Brabham F1 rims. 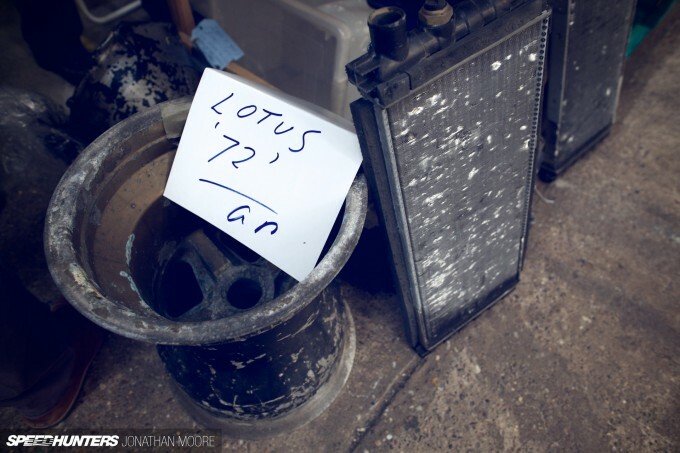 Or how about some rather battered examples from a Lotus 72, in need of both a good home and a healthy quantity of cleaner? 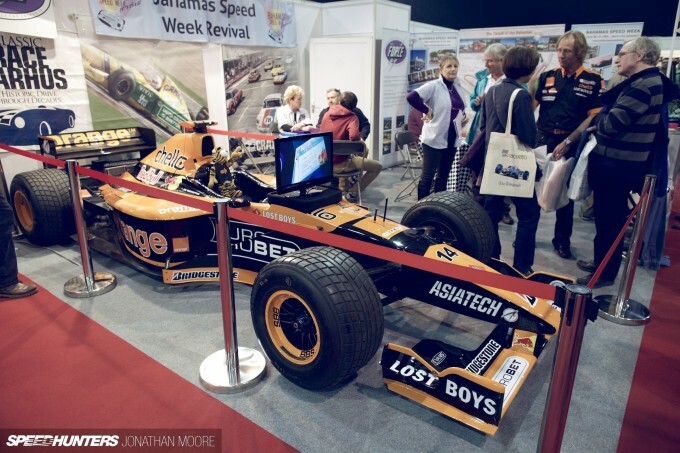 Want more modern F1 memorabilia? Arrows merch from the Orange period seems to crop up everywhere on cut-price race wear stalls, so seeing an entire car wasn’t a massive surprise: it might have come free with an Arrows raincoat.